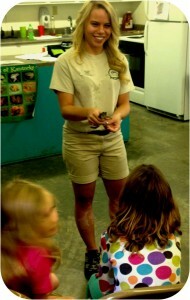 Campers learned about nature, frogs, and toads last week. Maggie Lawrence, assistant naturalist at John James Audubon State Park in Henderson, Ky., visited to share her knowledge about the natural environment with our day campers. Maggie taught the kids about the importance of respecting nature with a program called Leave No Trace. She handed out backpack tags that noted different ways to respect the environment and to be prepared when out in nature. The campers learned how to stay safe when outdoors and the importance of respecting nature. They also learned how to identify poisonous plants including Poison Ivy and Virginia Creeper, and what to do if they come across those plants. Maggie brought a special guest to Camp Green. Our campers experienced a live Green frog up close and personal. Maggie safely captured and later released a wild Green Frog to educate Camp Green about the frog species and why they are so beneficial to the ecosystem and the world around us. The 4-5 grade campers will visit John James Audubon State Park and Assistant Naturalist Maggie Lawrence on August 4th.